No matter how I wish I could be such a person in the past few weeks, I am still an ordinary women with one head and two arms, handling challenges one by one. The difficult time wouldn’t be forever long. It could be close to the end before we realize it. Sometimes, ignoring one or two tasks makes life much easier. Blogging is probably on the top of my to-skip list now and crafting might be somewhere in the middle. In spite of all the , I finally made the very first homemade toy for little K. Hooray! I just don’t feel like making any “traditional” soft animals at the beginning. Little K already got quite a few different animals from our friends. Therefore, my first toy for her has to be something so special that only little K can have it. Little K happened to have a nickname that has something to do with octopus. I went to the department stores to check out the infant toys. Surprise, surprise, there are not so many oceanic creatures, so I started sketching octopus since Christmas. It didn’t take me long to have a rough idea of the octopus I wanted to make, but making it is another thing. I am simply scared of any repetition in crafts. The eight “identical” arms are totally a nightmare for me, not to mention the multiple circles that represent the suction cups. None of them are the same. More than half of the time were spent on these arms. If I didn’t finish the arms in one shot (one night after little K went to bed), I might never finish the whole thing. 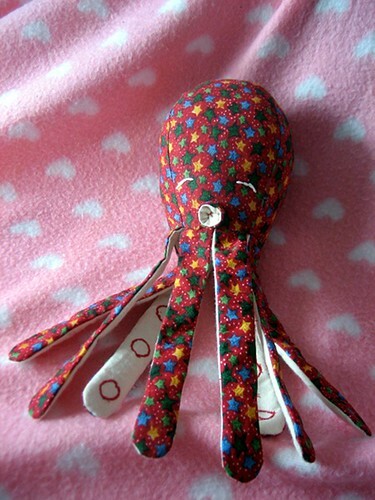 There are a few octopus patterns online (e.g. 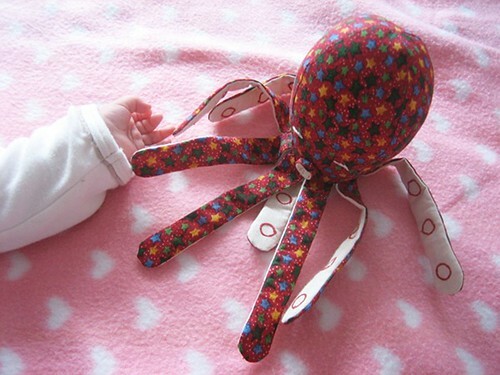 futuregirl’s felt octopus and hulucraft’s patchwork one) and a lot of very inspiring stuffed octopus around. I followed roughly a tutorial without a pattern. It took me a few attempts to get the head in a satisfied shape. I didn’t stuff the arms and didn’t make it too long so that I don’t need to worry she strangle herself with the toy while the arms are easy for little K to grab.